Welcome to the 30 Wishes for 30 Years fundraising page! We are looking forward to a big job ahead as we realize another significant milestone in our Chapter, 30 years of granting wishes in East Tennessee! To honor the occasion, we are seeking 30 generous donors to step forward to adopt 30 wishes. This will give us the head start that we need as we head into a new wish granting season with already 111 wish kids waiting for their wishes to come true. We also have the exciting opportunity from a gracious supporter that each gift that is given (up to $50,000) to our Anniversary campaign that gift will be matched. Your gift will be able to be doubled! To a child with a critical illness, doctors offices and hospitals are all too common places and worry and uncertainty are all too familiar feelings. For children like this, one true wish can make all the difference. So with that said, Make-A-Wish East Tennessee needs your support now more than ever. We've seen dramatic growth in the number of wish requests we are receiving and only through your generous donation will we be able to grant each and every one. Last year, our community stood with us to help grant 78 wishes, from a wish to be a pirate and a backyard pirate play ship to a behind-the-scenes Broadway experience. Our wish kids have such wonderful imaginations and their wishes would not be possible without support from our Make-A-Wish East Tennessee family of donors, volunteers, and other supporters. 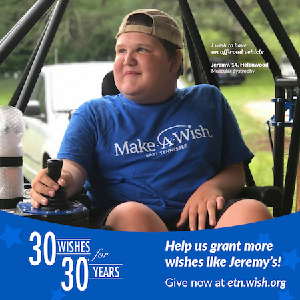 Fourteen-year old Jeremy from Helenwood, TN, has always had a passion for the outdoors and shared many fond memories outside with friends and family before being restricted in mobility. Jeremy's wish to have his own wheelchair accessible off-road vessel was the perfect wish to get him back outside enjoying what he loves the most. And simply being able to just be a kid riding with his friends. His wish didn't just do that it did so much more, it granted him independence and confidence. Your gift will bring hope to wish kids like Jeremy who need a boost of encouragement. Please donate today and PLEASE SHARE THIS PAGE WITH YOUR FRIENDS! We sincerely thank you for helping us bring these wishes to life and for making a difference in the lives of some very special children!